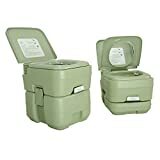 What Is The Best Portable Camping Toilet In 2019? Camping is one of the best experiences a family can share together. It is a fantastic way to connect to nature, get away from technology, and have a break from the stresses of everyday life. If you have never been camping, now is the perfect time to start and it couldn’t be easier! One of the main things people always ask is, “How am I supposed to go to the bathroom while on my camping trip?” For many the answer would be: “You simply do your business in the woods.” But for a lot of people, this does not seem safe nor sanitary. The good news is there have been huge developments in camping toilets, allowing you to stay clean while doing your business in the outdoors. When choosing a camping toilet, the first thing you want to look for is cleanliness. Whenever dealing with anything to do with waste, you need something that is going to help you clean it. This can include buying a camping toilet with removable options so you can easily clean the cover. This also means that the camping toilet is equipped with flushing capabilities. This is ideal, so waste does not just sit there under the lid, but that it flushes naturally like a real toilet. Some flushing mechanisms are manual, while others are battery powered. Another thing to note when choosing a camping toilet is that it keeps odors in. Waste does stink a lot, and you do not want it ruining your experience, especially if you have to keep it in a confined space such as a RV; many of the top-notch camping toilets have the ability to do this. As well, you want an easy way to empty the waste. This can be done by simply buying one with an easy-to-use spout for pouring it out. Ensure the camping toilet you purchase is leak proof, as you want to avoid waste messes before they can happen. 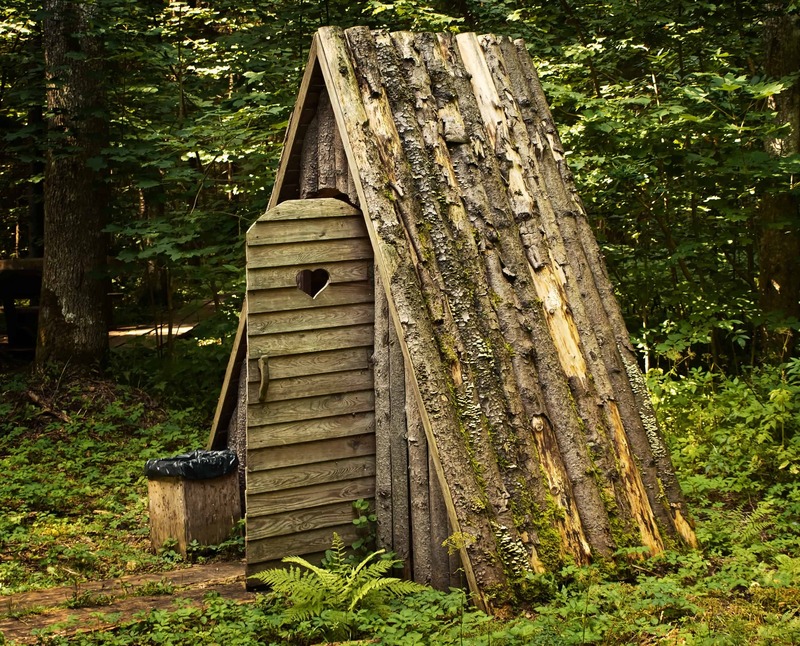 By following these guidelines, you will purchase one of the best camping toilets out there. Bucket-style toilet is a fancy bucket with a seat cover. It's cheap and puncture-resistant but requires a flat surface and takes quite a bit of space in a car. Also, it's easy to move around and flush as any other bucket. Collapsible toilets are foldable constructions with the main goal to seat you comfortably. They don't provide any means for waste disposal which should be done via attached camping garbage bag. The main benefit is the compactness and relative low price. Flushable toilet are as close as you can get to a normal toilet in your home. The comfort is the king here. There is a waste system built-in which allows flushing and keeps odors inside. However, they are the bulkiest and the most expensive among all types. Camco is the first brand known for making high-quality camping products at competitive prices. This specific product, when compared to others on this list, leans towards the cheaper side. You can either choose to buy this product in the 2.6-gallon size or the 5.3-gallon size, giving you plenty of room to do your business. The holding tank is detachable on this travel toilet. One of the worst things about cheap travel toilets is the smell. There is no way to stop waste from smelling bad, but there are various ways to keep that smell in. The Camco 41545 Travel Toilet has a valve that seals tight, locking in unpleasant odors and protecting against any leakage. The pump on this travel toilet is a bellows type, making it very easy to use and flush that waste into the compartment. To fasten the tank securely to the toilet, there are side latches equipped in place to make this a fast and easy process. The Camco 41545 Travel Toilet measures 16.4” by 16.25” by 18.4” and weighs 11.7 pounds when empty. When it is filled up however, it weighs 56 pounds. The inside of the tank that holds the waste has a slick surface that makes the removal of your waste efficient and easy. The lid on this product also can be closed to transport it easily, but can also be completely removed. This is a huge benefit, especially if you want to do a thorough clean of your product (which we highly recommend). The material the Camco 41545 Travel Toilet is made out of is ABS resin that is very durable and will not scratch. The width of the seat on the outside measures 12.6”, while the inside of the seat measures 8.4”. This specific toilet is one of the cheaper options on our list, so if you are looking to save some money while purchasing a camping toilet, this may be the one to look at. 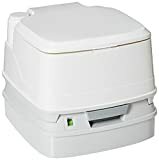 The Reliance Products Hassock Portable Lightweight Self-Contained Toilet is extremely lightweight, making it very easy to take mobile. This is integral for anyone looking to take it with them while they are camping. To keep things smelling fresh and for the device to clean, it comes with an Eco Fresh packet. The seat has been contoured to increase comfort for the user. There is an inner splash cover on this toilet to diminish any messes you may have, especially if you are using it in a vehicle. There is also a toilet paper holder equipped on it, for easy storage. The inner bucket of this toilet is removable, making it very easy to maintain its cleanliness. Another product that Reliance makes that is great is their “Double Doodie bags” and this travel toilet is compatible with them. Once set up, this toilet measures 14.7” x 14.7” x 14” (LxWxH) and weighs 5 lbs. when empty. It has been designed for campers and for people who own a boat and want a toilet on board. If for any reason you are not satisfied with your product, or there is a defect brought on by the manufacturer, there is Reliance’ 5-year warranty on this product. Thetford is known for creating high-end products to take on the go with you. At first glance, the 92360 is the coolest looking camping toilet. It looks high end and feels high end. The reason we reiterate that it is higher end, is because the price is reflected in that. This toilet is the most expensive on our list, but Thetford is known for that. Whenever examining a product that is more expensive, we want to make sure there are more than enough features to justify that price point. This Thetford Portable Toilet is very sleek looking with a modern design to look like a toilet at home. The seat height has been placed at a comfortable level, making it great for both short and tall people. The bowl size has been increased when compared to other products, and is able to hold a lot of waste. There is an integrated toilet paper holder, making it easy to get rid of that waste and to always have some on the go with you. Unlike other products, the Thetford 92360 Porta Potti 550E Curve Portable Toilet is equipped with a battery-powered flush. The controls for this flush are hidden inside the toilet. There is an indicator on the outside of this product that lets you know when you are going to need to add more fresh water, and when you are going to have to empty the tank. This is crucial, as you never want waste to build up to the point where the device stops working. There is an easy-to-use carrying handle on the water tank, making it simple to fill it up and keep the toilet full and working. There is also an optional hold down kit available on the Thetford 92360 Porta Potti 550E Curve Portable Toilet. The dimensions of this toilet are 17.5/8” high, 17-3/4” deep, and 15-1/4” wide. The tank can hold up to 4 gallons of water, and can also hold up to 5.5 gallons of water with waste in it. On the average, it is capable of 56 flushes per tank. There is a pour-out spout located on the tank that is easy to use and empty. This is a great way to empty the waste you do not want built up in your toilet. There is also a cap that can go right onto the pour out valve after cleaning, making it simple to maintain sanitary conditions. This device is also odorless and leak proof to avoid any unwanted messes. This is a 5.3 gallon travel potty, able to hold a lot of water and a lot of waste as well. The material this is made of is polyethylene of a really high density. This makes it very durable and able to last a long time. There is a fresh water reservoir holder equipped in this portable toilet, that holds a lot of water and will never mix with the waste water. The waste tank is separate and will also hold a lot of waste that you desire. The seat post measures 14” long and 14” wide. It is built to hold anyone up to 300 lbs., making it great for most people. There are no external connections required with this device, making it perfect for being in the outdoors. There is a side valve on this product that has a very tight seal, protecting you against any leakage that you do not want. This side valve also locks in odors so this toilet can be around guests, and you will not be able to smell a thing. As for flushing, this device can easily flush and rinse the entire bowl clean after every time. It is connected to a water pump that releases a fresh stream of water with every flush. The 92850 has an easy-to-read indicator on the outside, so you can tell when the tank is empty and full. This can really be a life saver for those of you who want to ensure you empty it when it needs to be. 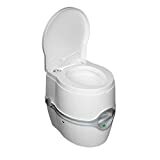 As for emptying, you want a camping toilet that is easy to empty, there is the exclusive Thetford pour out spout, that is easy to use and gets rid of all the waste you want. To decrease any form of smell from the waste, there is also a sealed valve to keep the odors in. The seat and the cover can be removed so you can regularly clean them down. It uses a piston pump flush to clean the bowl every time after using. While we believe all six of the products above are great options, the one that is above the rest is The Thetford 92360 Porta Potti 550E Curve Portable Toilet. However, it is also the most expensive, and we understand that many will not want to spend that much money on a camping toilet. However, it comes with the most features, is battery powered and has a fantastic look. We highly recommend it, and if you want a cheaper option check out any of the other brands.